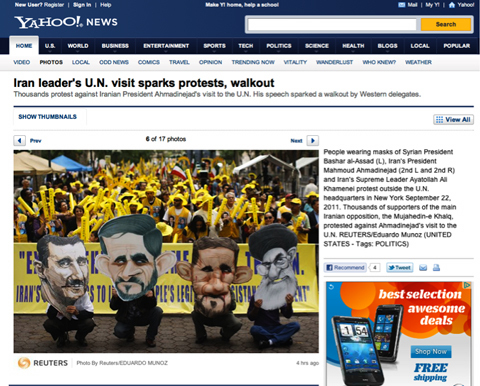 It's been brought to my attention, via Allen Forkum and others, my Ahmadinejad (second from the left) and Khameini (fourth from the left) caricatures have inspired Iranian protesters once again. I'm digging the size of the masks. Very enterprising. You should add "inspirer of revolution against authoritarian regimes" to your resume. If you already have it on there, add a couple of plus signs next to it. Castro and Chavez are envious! Thanks for the enthusiasm. You know, it's all so weird that these images land in volatile places. It's now like i could EVER anticipate where my caricatures pop up. I guess every revolution needs a bit of eye candy. Weird? I think it's interesting how your artwork keeps popping up. The back-story sends me to a whole new level of P.O., but I'm not dwelling on it. I don't want to wish time away, but I'll be glad when "jesus" goes back to Chicago*, as I think he could even turn water into swine. * In case you haven't heard it, that's a twist on a ZZ Top song. This page contains a single entry from the blog posted on September 22, 2011 6:18 PM.